This summer has been a whole heap of crazy fun already, so much so that my feet haven’t really touched the ground and I’ve been a little tardy in sharing everything I’ve been doing with you, dear readers. I endeavour to post a YouTube video every Friday, update Bikes n’ Stuff a couple of times a week, stay on top of my sponsorship commitments and stick to my freelance deadlines but juggling work, training, racing, family and travel takes a lot of stamina. Sometimes I fail to keep all the balls in the air, one of them gets dropped and I have to take a bit of time to get everything in order again. So that’s what I’m doing now – going a little easy on myself by racing slightly fewer events, easing off on the travel and spending more time at home with Dave and the wee cutie. That being said, when I’m away I make sure to pack in as much as I can and it seems ŠKODA have cottoned on to this fact, ensuring that each and every adventure we go on together is a non-stop whirlwind of excitement. It actually makes the cycling the least tiring bit! 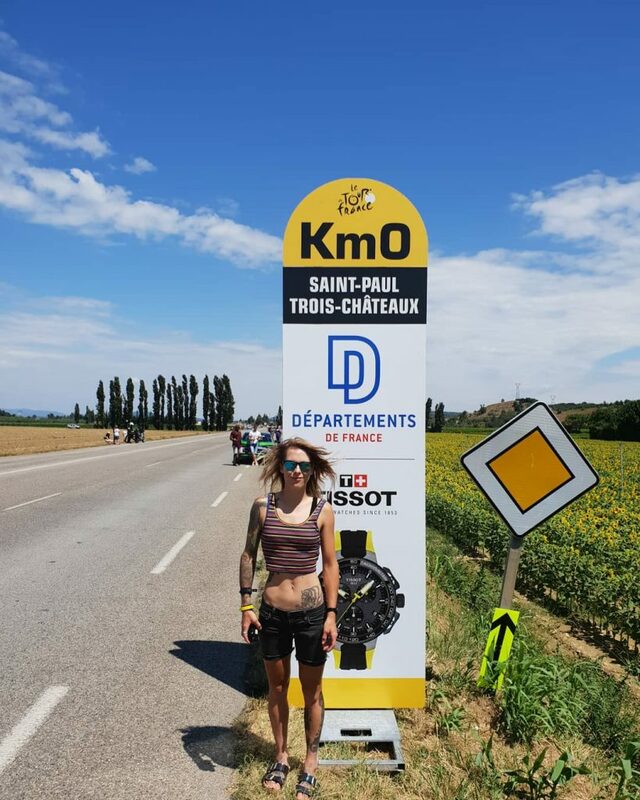 My latest trip with them was to the Tour de France, where as you know I spent a glorious day riding 175km the foot of Les Deux Alpes to Valence with a group of thirteen women. Catch up on that part of the story here. After the ride, once in Valence – a really lovely city on the edge of the Ardeche – I bid my friends farewell, rode to my new hotel, checked in and then strolled out along the boulevard in search of sushi and Vichy water (yes, I am a total ponce). I slept soundly that night and dreamt of mountains, my legs pleasantly heavy between the crisp, cool sheets – if only my sheets felt like that at home instead of being eternally dotted with toast crumbs. The following afternoon I rode out down from the centre and crossed the Rhone to the Ardeche with no itinerary in mind – the luxury of an smartphone is that you’re unlikely ever to get truly lost. The route I chose rose mirrored the west bank of the river up to Tournons sur Rhone, where I crossed once again. Continuing deeper into wine country I passed trees festooned with apricots and numerous stalls selling the golden fruit in overfilled crates. I’m mad for the kind of fruit you in find in Europe in the summer months, it’s so luscious, scented and juicy; a million miles from the hard, frigid stuff we get in the UK. After a couple of pleasant hours it was time to meet the winner of the ŠKODA Vip Experience package, whom I’d picked myself out of the many entries to the competition. We all headed to dinner for an overview of the day’s events in the Tour and an outline of what we could expect the next day. Over a glass of Cotes du Rhone (which I’d been craving since riding through those vineyards) we met our hosts and drivers for the next 24 hours, all of whom turned out to be ex-professional bike racers – Andy Schlek, Tim Harris and Johan Vansummeran amongst them. The following morning we kicked things off with an early bird ride with some of the guests and drivers, all of whom relish the chance to spin their legs before the day’s driving. Unfortunately, I lost everyone except Johan when I got a puncture as despite coming prepared with a fresh tube I had the world’s worst pump so it took about 2o minutes to get the tyre pumped up to 20 PSI. I really must get on the case with C02 cartridges – it’s about time I modernised and gave them a go. Showered, changed and full of breakfast – oh, how I love hotel breakfasts! 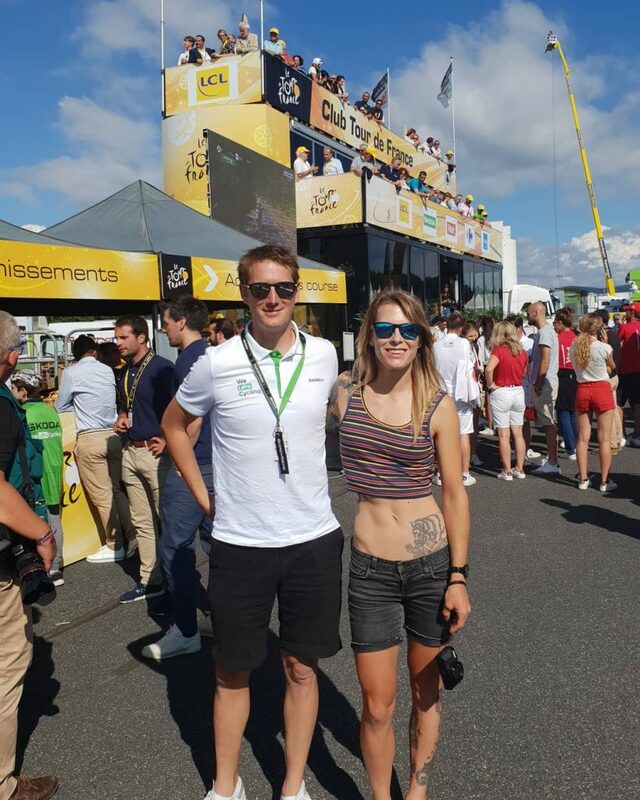 – Darren (competition winner), Peter (ŠKODA) and I hopped in Tim’s car and drove to the Departure Village where I tried my hardest to find Peter Sagan. 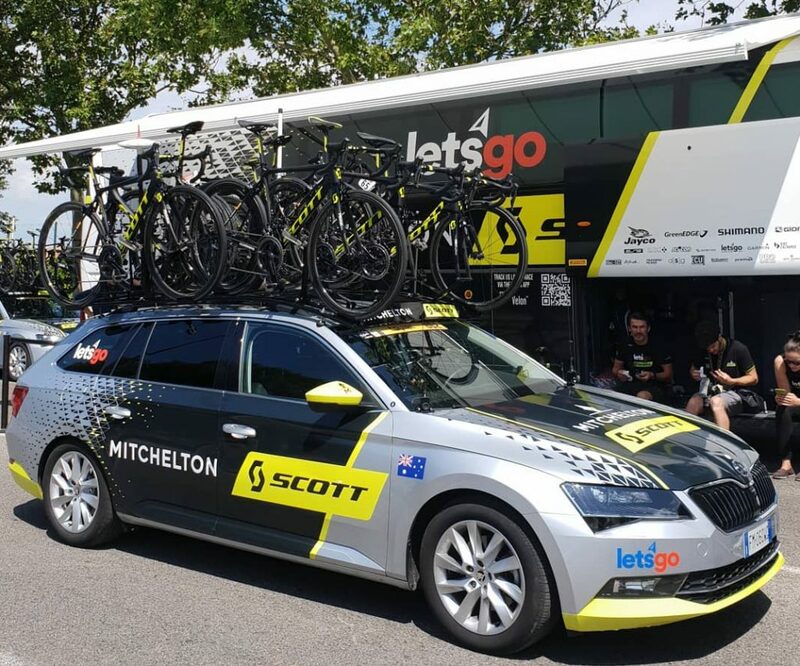 I would have killed for a peek inside a bus but of course, such an intrusion would be massively annoying for the team about to race the most important event of the year. Unsurprisingly, Sagan was hiding but it was such a thrill to see all the team buses and bikes as well as the mechanics and support staff busy preparing for the day’s stage. 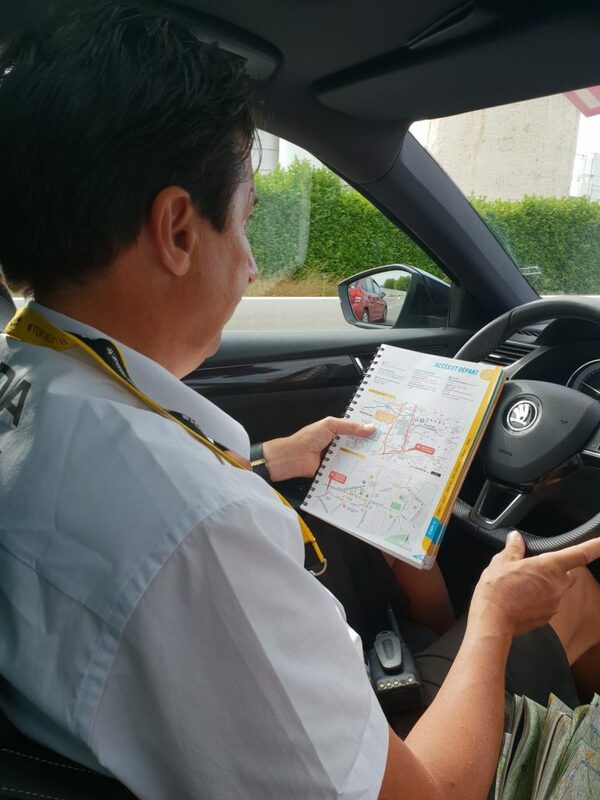 After what seemed like the shortest amount of time, we hot-footed it back to the car to get out on the road before the riders departed, Tim putting the pedal to the metal as we flew down the closed roads ahead of the race. We passed crowds of exuberant fans, Tim playing comedy jingles through the car horn system to their great delight. The day’s stage was hilly rather than mountainous, but it sure seemed tough as we sped up the road clinging to the edge of the Gorge du Verdon, a place I remember with fondness thanks to many happy childhood holidays. Back down at the bottom, we waited for the riders to come through and they seemed to be with us in under ten minutes – this despite the fact we had hurtled through the course before them. It seemed incredible that they could catch us so quickly when they were on bicycles. 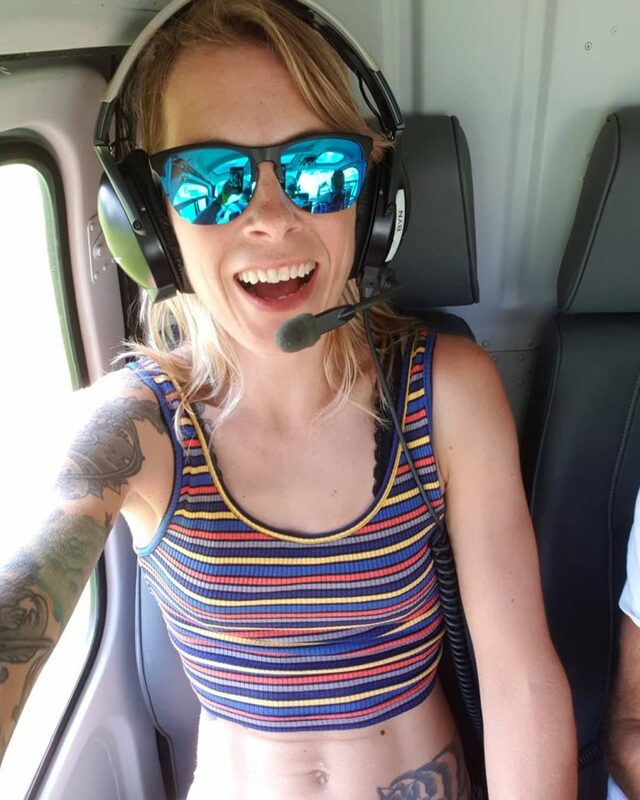 I was particularly excited to jump in a helicopter as I’ve never been in one before and we enjoyed the next part of the race from above. I only wish I’d put my camera down for a bit longer – sometimes I’m so busy filming and photographing everything that it’s over before I’ve had a chance to take it all in. After a wonderful picnic at the side of the road we continued to along to Mende, where after nearly 200km the rider would tackle the Col de la Creux, a 3km long climb at an average of 10.2%, with spikes of 18%! As we headed up the climb, the road emblazoned with words of encouragement, fans in fancy dress whooped and hollered knowing the riders weren’t far behind. In the nick of time we entered the VIP finishing area to watch Omar Fraile of Astana escape the bunch and stay away. It was thrilling end to a fantastic day, one that deserved a champagne toast. Thanks to ŠKODA for the invite. Please can I come again next year?